SAB TV’s magical Jeannie (Rubina Dilaik) always keeps putting her Juju (Ali Asgar) in a fix in Jeannie Aur Juju (Eagle Film Production). And this time she will leave no stone unturned when she will think of getting him inked, but this noble initiative will eventually backfire. The upcoming episodes will see how Jeannie would want Juju to get himself tattooed. However, with him being on a constant denial mode, she will plan to magically tattoo him. This magic will eventually backfire when her magic will go wrong and Juju will incidentally get inked all over his body thereby looking like a tattoo man. We wait for the uproarious episode to unfold!!! Love will blossom once again on SAB TV’s show Jeannie aur Juju as an utterly romantic character will be introduced in the show. Popular television actor Simple Kaul is all set to make an entry in the serial and woo the audience with her sweet antics. Simple will be playing the character of Mooni, leader of Moonistan (Chaand). Simple’s character Mooni represents the imaginary residents of Moonistan (Chand), who are believed to be very artistic, romantic and beautiful people and fall in love very easily. It so happens that love finds its way towards Vicky (played by Ali Asgar) everywhere he goes. Mooni will fall in love with Ali, after hearing him singing a song for Jeannie, After having a ‘Jeannie’ from Jinnland fall in love with him, Vicky now will have a new admirer in the form of ‘Mooni’ from Moonistan! Let’s see if Mooni proves to be a tough competition for Jeannie or not! Ali Asgar to quit SAB TV's Jeannie Aur Juju? Will the show survive or end? SAB TV’s fantasy show Jeannie Aur Juju, produced by Eagle Films Productions seems to be bagging all the limelight via controversies related to its actors being unhappy with the show’s progress. Also, viewers were surprised when Giaa Maanek all of a sudden got replaced by Rubina Dilaik for the role of Jeannie. The very recent exit of Amit Tandon and Neha Mehta from the show has apparently left the boat sinking. And to add to it are the rumours of the show going off air in the near future. We now hear that a final decision on whether the show will continue or end will be taken sometime next week. If this is not enough, there is news doing rounds that the male lead Ali Asgar too wants to quit the serial. The reason being that he is not able to handle both Jeannie Aur Juju and his other popular Colors’ show Comedy Nights with Kapil. And it goes without saying that Colors must be paying him more as well. Our source adds that Ali keeps telling his Jeannie co-stars that he is unhappy and would prefer to quit the project. Apparently, Ali had also put in his papers when Giaa quit, but the producers cajoled him to stay on for a couple of months more. Now that the interim period is over, the creatives are again convincing Ali to stay on failing which they would decide to continue with the show with a replacement. In fact, there is also a buzz of him moving out of the show by 12 December, 2013. Navina Bole who plays the role of Priya confirmed the news about the renewal talk happening with Ali, but did not know anything about the actor wanting to exit the show. “I don’t know if he is unhappy. We are a cool unit and I am sure things can be worked out if what you say is correct.” She further goes on to add that the ratings of Jeannie Aur Juju have gone up since the entry of Rubina. We tried to get in touch with Ali but to no avail. Although it has been a while since Giaa quit Jeannie Aur Juju, the rumours on the reasons related to her exit keep floating around. According to one such report, Giaa was asking too much money and was threatening to quit the show and take up another project, if her demands were not met. Hence the channel decided to replace her rather than succumbing to what they perceived as blackmail. A source close to Giaa though added that the allegations of blackmail are laughable, for today no one is indispensable. Was Giaa not replaced in her debut Star Plus show Saath Nibhaana Saathiya? Also she is not looking for any other show at the moment. She will take a break now that she is no longer doing Jeannie Aur Juju and will recharge her batteries before contemplating a comeback. The same source further added that Giaa was not replaced as our above source’s assertion. She quit the show because the makers were asking her to continue after her contract expired at a much lower rate than what was paid to her before. Well, with so many problems, will Jeannie Aur Juju remain afloat? If so, what are the immediate changes that the makers will come up with? Nothing seems to be going right for Eagle Telefilms’ Jeannie Aur Juju at the moment. Well, it was just recently when Giaa Maanek got replaced by Rubina Dilaik as Jeannie. And while the latter was trying to fit in the former’s shoes, Amit Tandon, who played Rahul on the show called it quits. And now the latest is that Neha Mehta, better known as Jiya in the serial, has also quit the show. Yes, the actress has put in her papers and if sources are to be believed, she will be making an exit from the serial by the end of this month or early next month. But why is she quitting the show? “There is a surgery scheduled in my family for which I will have to go to Singapore and since this is a very personal affair, I wouldn’t want to comment more on this,” the actress informed. Didn’t the producer of the show try to stop her? “They wanted me to stay back but I couldn’t. Producer Rajeevji (Mehra) is very understanding that way,” she averred. We wish you all the luck Neha! The next time SAB TV’s lovable character ‘Jeannie’ of Jeannie Aur Juju fame, emerges from the magical bottle, her fans will be in for a pleasant surprise! Dressed in the customary Jeannie attire, the beautiful& vivacious, Rubina Dilaik, will be seen casting her spell as Jeannie in the fantasy world of Jinland! Rubina Dilaik, one of television’s most lovable bahus who gained popularity via Zee TV show Choti Bahu, will be mesmerizing the audience once again as the new charm of Jeannie Aur Juju. The favourite of millions of fans across India, Rubina will be keenly followed in her new role as the bubbly and naughty Jeannie, as she brings her effortless charisma & adds more fun and mischief to the lovable character. In the forthcoming episode Jeannie will be taken hostage by the extremely powerful ‘Jin Junnon’ from Jinland who plans to sacrifice her in order to attain additional powers. Vicky takes on the impossible task of travelling all the way to Jinland to save his beloved. However, the all-powerful Jin Junoon has other wicked plans up his sleeve. Jia and Johny too will land up in Jinland, and they realise that the only way they can now get Jeannie’s life back is through an elixir, i.e, ‘sanjeevani booti’. Vicky then sets off on a mission to get the elixir for Jeannie, an elixir that will not just save Jeannie but also give her an all new identity. Catch the magic of Jeannie in Jeannie Aur Juju on SAB TV. It’s chaos on the sets of SAB TV’s Jeannie Aur Juju!!! Well, Tellychakkar.com has learnt that the show’s female lead Giaa Maanek has been asked to leave. Our sources have suggested that Giaa was acting way too pricey and after her starry tantrums touched sky high, the makers (Eagle Films) decided to let her go. So who is replacing Giaa? Well, we have the answer…it’s none other than cute and petite Shivshakti Sachdev. Shivshakti gained fame playing the role of Bebo in the show Sabki Laadli Bebo. We called up Shivshakti and her dad answered the phone. Shivshakti was busy and her dad asked us to get back later, which we will do in coming time. 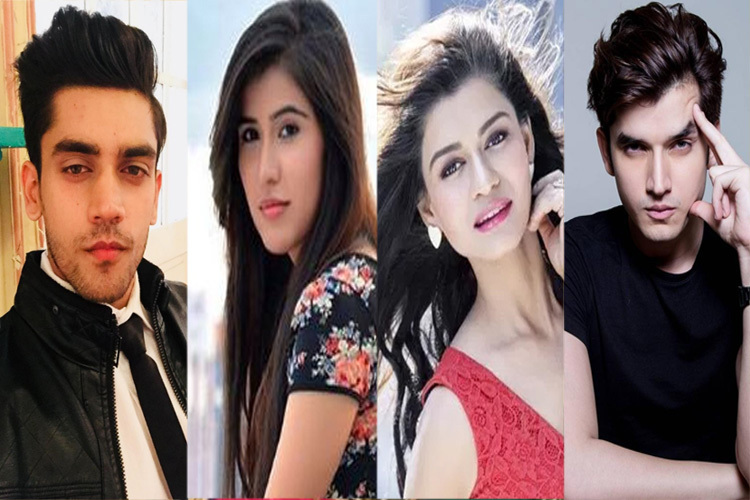 Furthermore, we have also learnt that Amit Tandon (Rahul) has also stopped shooting for the show and actor Karan Goddwani (Johnny) will soon make a comeback. We also got in touch with SAB TV Head Anooj Kapoor and he also chose not to comment for he was “busy in a meeting”.